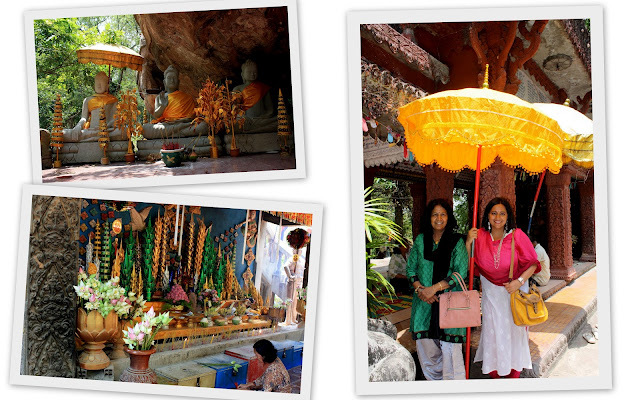 After a fun but hectic day visiting the temples, we decided to explore other sites in the area. 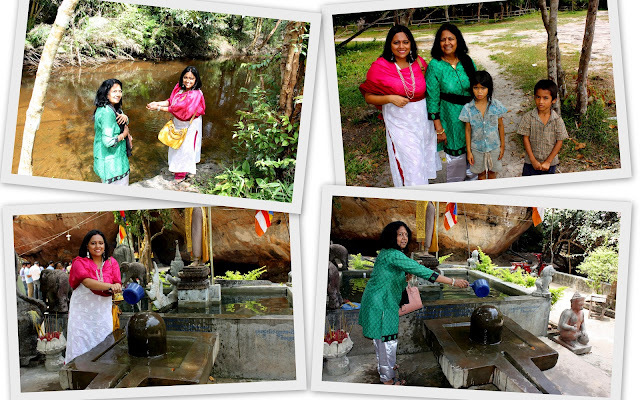 We first headed to Phnom Kulen, a river bed that is fully carved with 1,000 Shiva lingams. 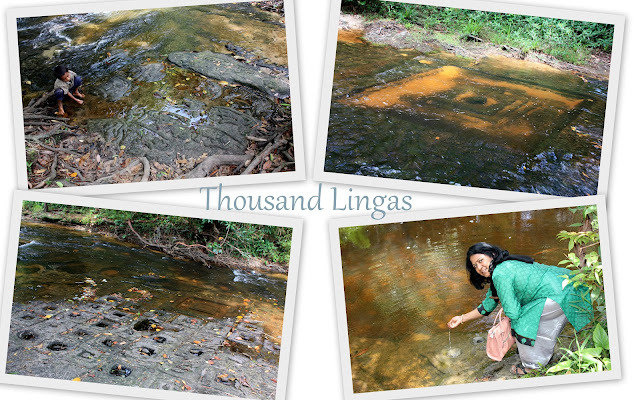 Locals refer it to Thousand Lingas. These carvings represent fertility and the water is considered holy for Hindus. There is also a stone carving on the river bed of Lord Vishnu lying on his serpent with Goddess Lakshmi at his feet. A lotus emerges from his navel and bears the Lord Brahma. The river leads to a magnificent waterfall which is a popular hangout spot for Cambodian families. 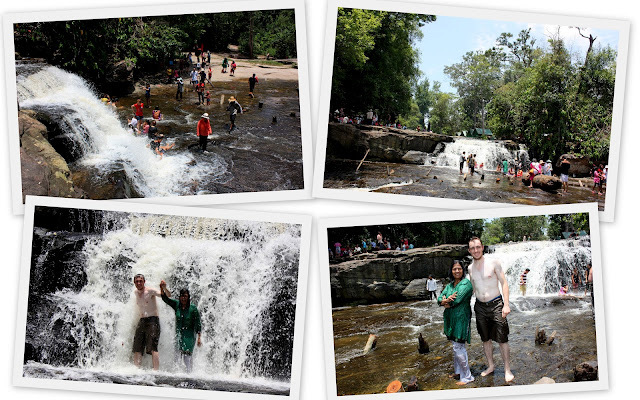 Phnom Kulen holds strong significance to Cambodians as it was the birth place of the Khmer Empire. This is where King Jayavarman II proclaimed independence from Java. He started the Shiva lingam cult in the area and used to bathe regularly in the river. As soon as we got there, a little girl came running to us and beckoned us to follow her. Although she could not speak much English, she was very excited in showing us the Thousand Lingas. She repeatedly kept saying, "Linga, Linga, Lingaaaaaaaaa!" and easily navigated through the area and brought us to all the right places. It was such a delightful experience and we touched the holy water for blessings. We then continued on to Preah Ang Thom, a place that is considered holy for Buddhists. Here, there is a large statue of a reclining Buddha reaching nirvana, apparently carved out of just one sandstone. The walk up to this temple was lovely and another little girl guided us there. 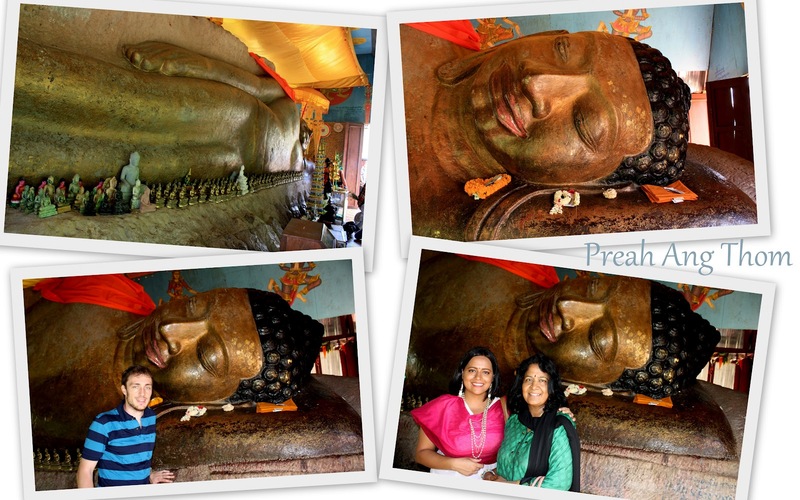 Upon seeing the giant Buddha, my mother and I joked that his face had a striking resemblance to Indian actor, Prakashraj! There were some priests conducting prayers for devotees and we had a good taking in the ambience. At the entrance of this temple is a big Shiva lingam where we could pour water over it and pray. It was here that a lady with a little baby girl approached us and gave me the baby in her arms. It was a very beautiful and special moment for me, especially since the baby came quite willingly to me. She was only 5 months old and wore a tiny purple skirt. So adorable! The lady blessed us to have a good future and we then continued on. We then crossed a very wobbly bridge to get to the massive waterfall. My mom would probably say that this was the highlight of her trip. She loves water and when she saw the number of people gleefully prancing around under the waterfall, she was tempted to join them. Given how hot it was, she found it so refreshing to be there. She was soaked wet in an instant but thoroughly enjoyed it. My hubby too joined her while I assumed my role of the cameraman and security guard:). 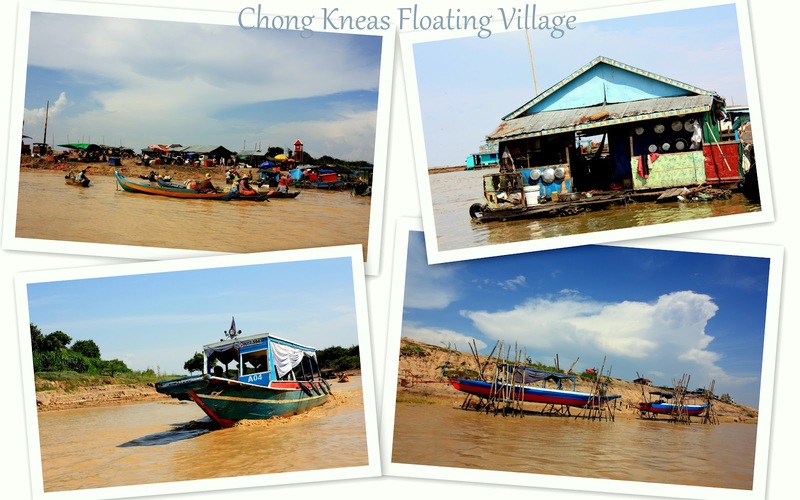 Our final stop was the Chong Kneas Floating Village. This floating village is situated at the end of the Tonlé Sap lake and is inhabited by the Cham people, some Vietnamese and Cambodians. As soon as we saw the water we knew that it was not even remotely clean. The place had a very fishy and sewage type smell and the water looked so brown and opaque. This floating village left a lasting impression on all three of us. It showed us how these poor people struggle every single day to survive and that they don't even have the basic supplies to lead an ordinary life. Most people there live on fishing but as the water often floods, many adults drown and lose their lives. The young children are then left without parents and have to grow up on their own. Our guide for this trip told us that the people actually drink the lake's polluted water - it is not even boiled to get rid of the impurities. We were sickened to hear that. And recently a couple went fishing in the night and drowned, leaving behind their 15 children. These children now live in the school there under the care of the teachers. Our experience there showed us just how pathetic these people's, especially the children's lives are and how cruel and unfair life is. We were brought to a crocodile farm where we observed some of these deadly creatures. We got to see the tiny houses where families huddled together to cook, eat and sleep all in one place. We even saw kids boldly holding pythons around their necks with absolutely no fear! Finally, we were brought to a shop where we were told that we could buy some food or water for the children in the school. As we were very disturbed by the children drinking the dirty lake water, we bought them some bottles of mineral water. 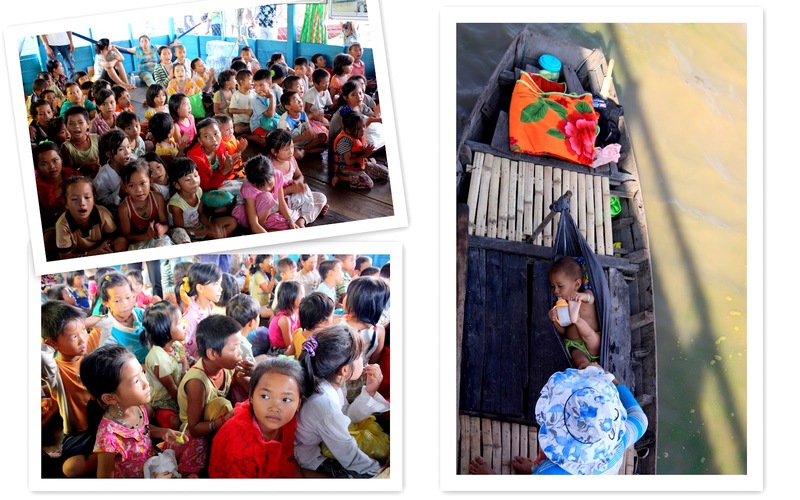 We were then taken to the school where young children between 3 - 15 were studying or living. This was the part that affected me the most. As soon as we entered, the kids started to sing and clap their hands for us - sort of in gratitude for the water we brought them. One little girl in particular just kept staring and smiling at me. She had the most soulful looking eyes I have ever seen. Her face was so pure and innocent and although she was smiling at us, I like she had been through very tough times in life. In fact I just felt like taking her with me to give her a better life. Even now I think about her every day and wonder how she is. Of all the 4-5 days we spent in Cambodia, this day was the one that was most special and left a strong impact on me, especially the poor children. I think ever since Angelina Jolie adopted a kid from Cambodia, there's been growing interest for people to adopt children from there. There are also many organizations whose purpose is to give a better life to these children and my experience in the country has got me interested in trying to help these children in some way or another. Every one of us can help them in our own little way and spread the word to create awareness! Next up, our journey to Phnom Penh! Thanks for sharing all these great memories! Unforgettable experiences!